You must be wondering what you can do during the Winter in Toronto. For most of the locals, that wouldn't be a question i guess. But for people like me, who just moved in the city, these are stuff i'd like to know. Nathan Phillips Square or simply Nathan Square is one of the most popular to-go place in Toronto. Situated just across Toronto's City Hall. During the summer they have a lot of activities, from concerts to art displays. 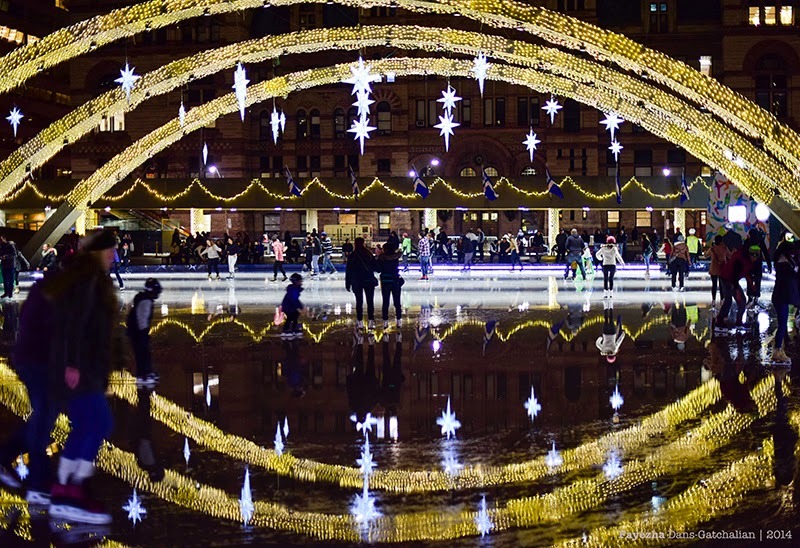 In the Winter, the reflecting pool is turned into a Skating Rink! There you go. That's what you can do in the winter...Skate! If you do not know how, you can just stroll around and watch the people skate. There's hotdogs and burgers around so that won't leave you hungry. This picture was taken in December when there was not much of people skating yet. That explains why you see stars hanging on the arches. These arches by the way are are dedicated as the freedom arches. In January, this place is just filled up with skaters. I don't know how you can comfortably skate in a full packed skating rink. But that's for you to experience. So there, don't know what to do? Head to Nathan Square!